Paris Jackson Finally Meets the 'Love of Her Life': Paul McCartney. Beatles Radio: The Beatles, Solos, Covers, Birthdays, News The Fab 4 and More! Paris Jackson is the daughter of pop royalty, but her heart beats for rock ‘n’ roll. She previously referred to her father Michael’s sometime duet partner, Paul McCartney, as “the love of her life,” and Tuesday night she achieved her life’s dream of meeting her hero. The long-awaited summit went down Tuesday night in Los Angeles at a star-studded party thrown by Sir Paul’s daughter, megastar fashion designer Stella McCartney. Dubbed “Stella-chella,” the Coachella-inspired festival featured some of the fashonista’s famous friends, including Katy Perry, Kate Hudson, Goldie Hawn, and new couple Dakota Johnson and Chris Martin. 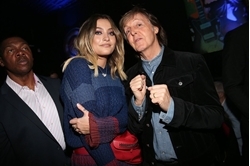 It was there that Jackson, rocking a striped sweater dress and oversized red fanny pack, managed to snag a picture with the 75-year-old Beatles legend. Clearly, it was a moment she would never forget. “I cried like a goddamn baby,” she captioned the photo when she shared it to Instagram. In an interview with Teen Vogue last May, Jackson, 19, admitted that she doesn’t have a strong desire to be a public figure, but would like “just to get better at writing.” Specifically, she’d like to write a song for a certain former member of the Fab Four.